WISCONSIN VS. MICHIGAN: YOU BETTOR, YOU BET! (October 14, 2011) --- With the Green Bay Packers and the Detroit Lions leading all other teams in the NFL, the University of Wisconsin and Michigan football squads both currently undefeated, and the Milwaukee Brewers and the Detroit Tigers swinging toward the World Series... the stakes have been raised between America’s Dairyland and the Motor City. A long time ago, sports rivalries somehow turned into a political staple. You know the routine, days before a big game; mayors or governors feel compelled to make wagers distinctive of their cities or states. Just a few very random images of QB's Rodgers, Stafford, Cutler and McNabb. So, which NFC North quarterback would you put your money on to take you to the Super Bowl? 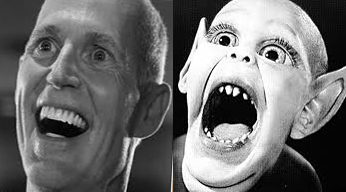 For instance, just last spring before the NBA Finals, Florida Governor Rick Scott wagered several bushels of hanging chads in support of the Miami Heat while Texas Governor Rick Perry backed his Dallas Mavericks by putting up a truckload of illegal immigrants. It all began last week at a “We Are the 1%” black-tie fundraiser where Wisconsin Governor Scott Walker and Michigan Governor Rick Snyder were bragging about their state’s Major League Baseball team’s chances of making it to the World Series. Florida Governor Rick Scott may not believe in Climate Change, but for some strange reason he does believe in "Bat Boy." In a matter of minutes it turned into “put up or shut up” time. Snyder, confident in his Tigers, bet some authentic GM auto parts; Walker backed the Brewers with a tasty cheese platter. But it didn’t stop there. If the University of Wisconsin football team finishes with a better win-loss record than the Wolverines, Snyder has to address his annual televised “State of the State Statement” in nothing but Oshkosk B’Gosh overhauls and a cheesehat. And if Michigan bests the Badgers, Walker's gotta French kiss Michael Moore in the back seat of a Chevy Volt. But the moment they started debating who had the better NFL team, the two Republican governors got down and even more dirty. 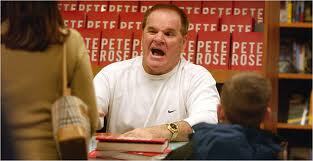 When Pete Rose's addiction counselor said he thought "the odds were good" that he'd beat his gambling problem, he saw it as a reason to immediately call his bookie. With Green Bay and Detroit sitting pretty at 5-0 as the only two undefeated teams left in the league, it suddenly got real serious. The bet: Which franchise would make it to Super Bowl XLVI... the Lions or the Packers? Walker immediately backed the Pack by wagering a case of Johnsonville bratwurst. Snyder countered by supporting his Lions with a crate of Kellogg’s Frosted Flakes. Walker then upped the ante by throwing in the Oscar Meyer Wienermobile. Snyder matched that bet with the deed to the old Pontiac Silverdome. Walker then went “all-in,” raising the stakes with the addition of the Apostle Islands, Bob Uecker and the BoDeans. Snyder matched his nemesis by putting up Lake Michigan, Ted Nugent and a bunch of stuff they stole from Indiana. 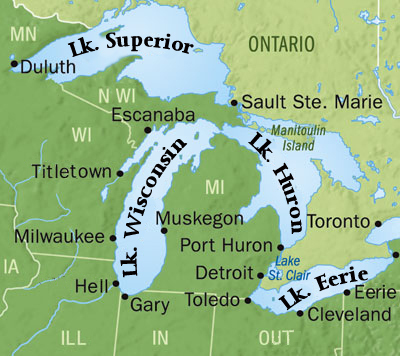 An early look at Rand McNaly's updated Great Lakes States map to be released in February, 2012. But just yesterday, Snyder noticed Walker was limping and asked him what was up. "Oh, it's just an old baseball injury." "Really? I didn’t know you played the sport!" "Oh no, I never played baseball! After the Brewers lost that playoff game to the Cardinals last night, I kicked in the TV." In related news, Las Vegas oddsmakers now have the Edmonton Oilers leading the Minnesota Vikings as having a better chance at winning the Super Bowl this season.